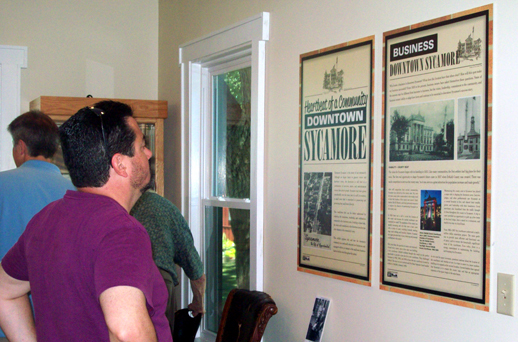 This exhibit featured the strong agricultural traditions that are part of Sycamore’s history. The story of the Engh Farm, changes in technology, the history of the DeKalb County Farm Bureau, and social life connected to living on the farm were all explored. 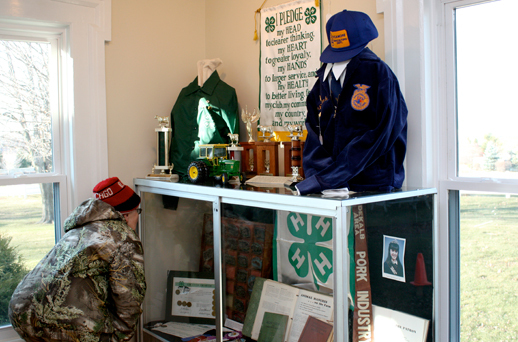 Students also interviewed local farmers, and quotes from the farmers were included throughout the exhibit. How has Sycamore’s downtown survived? This was the main question in the exhibit, and the answer involved leadership, vision, community service, and support. Those committed to this community embodied these qualities explored throughout the exhibit. 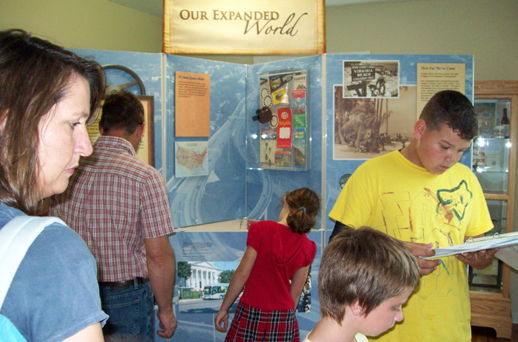 A dvd with images and voices from student interviews were incorporated into the display. Who makes Sycamore work? How does Sycamore work? Where does Sycamore work? What makes Sycamore work? 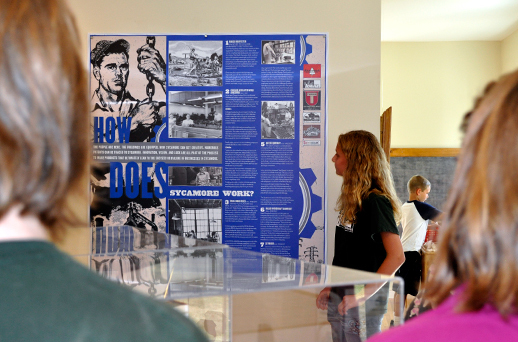 These questions shaped our 2011-2012 exhibit exploring Sycamore’s industrial history. The significance of the products to this town was examined, but so were the people who created and manufactured them. Video clips of student interviews were also included. Panels of exhibit are still available to those who might be interested in viewing part of the exhibit. Come on over and PLAY! Yes, you are welcome to play at the History Museum. If you have not been to the museum in the last few months you are missing out. 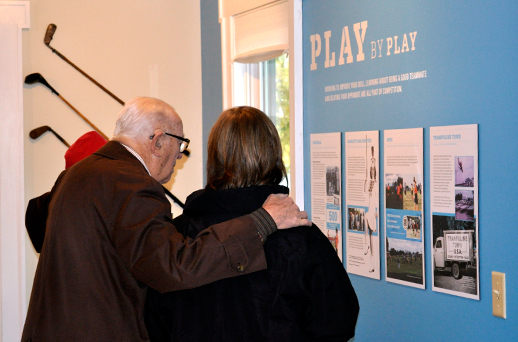 The current exhibit looks at how we play, and you cannot think about play without having fun! Highlights include the chairs where high schools students enjoyed many basketball games, the old projector from the Sycamore Theater, Marilyn Majorette uniforms, photos of Trampoline Town and many uniforms from Sycamore Youth Baseball and AYSO soccer. Yes, we have items from last summer’s teams. History is not just 100 years ago, but created every day. Our six, seven and eight year-olds made history last summer and we are celebrating their stories. Don’t forget the hands-on room. Children are welcome to come and dress-up, play restaurant and even go bowling. The story of Everell Dutton’s life exemplifies the pioneer spirit, dedication of the solider, and richness of the Gilded Age. Through Dutton’s letters, photographs, maps, artifacts, and newspapers, we gain insight into the challenges, work ethics, and vision of man, community and nation. This exhibit is now closed, however please visit generaldutton.org. “Generosity is contagious. People see it in Sycamore, and they just want to jump right in and help out.” This quote is from Mayor Ken Mundy, and really sums up what happens in Sycamore on a regular basis. The Sycamore History Museum has integrated this idea into our current exhibit, “Faces of Sycamore: Our Community, Our Story” to demonstrate how local residents have shaped Sycamore over the years. This exhibit tells the story of people – from today and yesterday, young and old, men and women, from a variety of backgrounds – all who have made a difference in Sycamore. While the exhibit is a small sampling of people who have shared their talents, we hope that visitors will walk away with ideas about how they can contribute to the place many of us call home. Some of the faces will be familiar such as Wally Thurow, Clifford Danielson, and Yvonne Johnson, while others are less well-known, but they all have service and passion in common.